BOOK NOTES: "The Inflationary Universe"
Pg. 4-11: Gravitational energy is negative with respect to energy/mass consisting of positive energy. Pg. 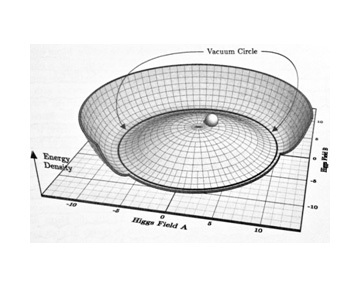 12: Energy is released when a gravitational field is created. Pg. 15: Inflation results in the creation of matter and gravitational field with zero total energy. Pg. 41-44: Alexander Friedmann and closed, open, asymptotically bounded universe. Pg. 53-55: Georges Lemaître, Arthur Eddington – derivation of GR equations - expansion. Pg. 62-64: Dicke, Wilkinson, Roll Princeton group fashioning an antenna at Princeton to receive blackbody radiation from the big-bang based on the idea of an oscillating universe. Pg. 66-67: Jim Peebles submitted a paper on a theory of CMB to Physical Review 3/1965 which was rejected. Before the rejection, he presented the work at a colloquium on Feb. 19, 1965, which was attended by Kenneth Turner – an old friend from graduate student days at Princeton who, along with his wife and daughters were staying with Peebles for the visit. Turner subsequently mentioned the colloquium to fellow radio astronomer, Bernard Burke who was a friend of Arno Penzias. Burke spoke with Penzias by phone and asked about the Crawford Hill horn measurements. Penzias mentioned the unexplained and persistent noise prompting Burke to suggest that he phone Dicke who, after a quick visit and data review was convinced the noise represented blackbody radiation from the CMB LSS. The groups decided to publish back-to-back papers to the Astrophysical Journal (experimental evidence by Penzias and Wilson: “A Measurement of Excess Antenna Temperature at 4080 Mc/s [7.35cm]” , and theoretical discussion: “Cosmic Black-Body Radiation” by the Dicke group). Pg. 85-104: derivation and listing of temperatures, densities, events, etc. 1 year after BB T= 2 x 106K at 106 x Earth’s current atmospheric pressure. 7 days after BB T=17 x 106K at 109 x Earth’s current atmospheric pressure. CERN at 7 TeV probes universe at 5 x 10-15 seconds after BB. CERN at 14 TeV probes universe at ____ seconds after BB ??? 10-39sec after BB T = 1029K with average particle energies of 1016GeV with a mass density of 1012 solar masses compressed into the volume of a proton. Big Bang nucleosynthesis responsible for 98% of baryonic matter in the universe today. George Gamow and colleagues calculated a CMB of 5K in 1948! e-/e+ = 1/3 mass w/ cessation of pair prod. Du, He4 (Du, being fragile, was a nucleosynth. bottleneck until 3.5 minutes. 50% of e-/e+ had annihilated into photons, still existing today with neutrinos at 1.95 today (colder as only weakly interactive therefore did not heat at same rate). There should be 300/cc today. Pg. 107-109: Steven Weinberg’s work on baryon antibaryon asymmetry. Pg. 108-110: At 10-6 seconds after the BB universe at 1013K too hot for baryons to exist with the quark:antiquark ratio = 300,000,000:299,999,999. With further cooling and the annihilations continuing without further pair productions, only the leftover quarks remained and formed baryons. As baryon number (1078) is always seen to be conserved at the energies achievable today, and as the proton is the lightest baryon – it appears to be stable with a half-life of at least 1032 years. GUTs suggest that at ~1029K (10-39seconds) baryon number violation becomes a common event. This would require asymmetry between matter and antimatter and the particle reactions must be slow enough that during rapid cooling, equilibrium densities would not be achieved. This cannot be explained only on the basis of chance – a too little asymmetry would obtain from that process alone. Brookhaven 1964 decay of the neutral K meson (kaon) was observed. Pg. 119-120: Steven Weinberg: electroweak theory. Gerard ‘t Hooft normalization solution. The strengths of the SU groups are experimentally found, not determined by theory. Pg. 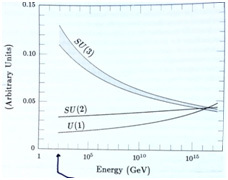 134: The interaction strengths of SU(1), SU(2) and SU(3) approach each other at very high (GUT) energies ~ 1016 GeV. That the three SU groups cross at a particular point is suggestive. Higgs fields (?24): lowest energy density at a non-zero field value. Where along the non-zero field values each Higgs field falls to from the zero-field, high energy breaking is possibly random… thus, the various particle groups interacting with the various Higgs fields develop their individual masses based on the possibly random field value taken by the Higgs fields during symmetry breaking at the 1016 GeV GUT energy density states. Question: what determines the value of the false vacuum energy level (seen here as the zero/zero point? Pg. 209-212: From Chapter 12: The New Inflationary Universe: Andrei Linde’s independently discovered inflation with a shallow, slow roll fall off of high energy density to a true vacuum which included a flat central region. Using this interpretation, Guth’s problematic bubbles with intervening exponentially expanding space disappeared as less time is spent in an over-stable central false-vacuum state as originally imagined. In this scheme, the universe grows within a single bubble of decaying false vacuum. [see: Andrei Linde, “A New Inflationary Universe Scenario: A Possible Solution of the Horizon, Flatness, Homogeneity, Isotropy, and Primordial Monopole Problems,” Physics Letters, vol. 108B, pp. 389-92 (1082)] Paul Steinhardt and Andreas Albrecht at the University of Pennsylvania had reached similar conclusions applying a type of phase transition found to occur in condensed matter referred to as spinodal decomposition. [See: Andreas Albrecht and Paul J. Steinhardt, “Cosmology for Grand Unified Theories with Radiatively Induced Symmetry Breaking,” Physical Review Letters, vol. 48, pp. 1220-3 (1982). Note: Sidney Coleman and Erick Weinberg had first proposed this energy graph in 1973. The updated model allows a bubble to grow sufficiently large before the energy density begins to decline – more gradually – allowing the bubble to grow to contain the entire universe then populated by the energy released as the fields oscillate around a true vacuum field strength at the base – the oscillations functioning to release the energy, as would occur in a mechanical system where frictional heat would be released by those oscillations within the true vacuum trough. If constructed late – much cooler, slow phase transition with super-cooling, then time for bubbles of phase change to decrease number of Higgs bubbles and thus to decrease numbers of monopoles. The issue as to whether such slow phase change would alter the expansion rate lead to thinking about inflation. False Vacuum and the Higgs field at ~max. energy density and minimum field value – not oscillating, therefore not associated with particles in that state – as universe expands, energy density of the false vacuum maintains same value. The pressure is mathematically a negative, less than that of a full vacuum. According to GR and positive pressure creates an attractive gravitational field, whereas the negative pressure of the false vacuum creates a repulsive gravitational field 3x stronger than the attractive positive pressure field. Pg. 189-200: Failure of original conception of multiple bubbles of decaying false-vacuum – resolution. Pp. 203-212: Andrei Linde 1981. See above diagram of shallow roll. Pg. 233-240: The magnitude of the perturbations depends on the shape of the Higgs energy diagram, but to achieve the correct order of magnitude of the observed variations, the central area must be so flat as to not allow for the spontaneous symmetry breaking that leads to the differences seen among the subatomic particles, appearing to require a new field – distinct from the Higgs, the inflaton. That field, unlike the Higgs diagram, must have an extremely flat energy density slope to allow for the CMB LSS variations to be so small (10-5). Pg. 241-242: Despite the apparent need to call for a new field, COBE, W-MAP, and PLANCK data confirm the signature of inflation – the undulations show scale-invariant density perturbations (at large scales). Pg. 237-243: finding that inflation must be driven by an extremely flat energy density diagram (see above diagram of scale-invariant density perturbations pointing strongly to inflation despite the need to promote a new field – the inflaton). Pg. 245: the observable universe a minute fraction of all that exists within this bubble. Pg. 246: Driving force of inflation: false vacuum consisting of a Higgs-like field – the inflaton field, which decays exponentially, i.e. with a half-life (of something like 10-30 – 10-35 seconds. In one half-life, the field that has not decayed continues to expand exponentially. But, the rate of expansion is far greater than the rate of decay!!! Pg. 246: “…once inflation begins, it never stops!” Thus, there is no parent false vacuum with bubble universes within it, as each bubble contains regions of eternally and exponentially expanding false vacuum regions with it – an infinite fractal evolution. Pg. 249: Reiterating: other bubble universes, receding at superluminal speeds can never be detected. 1. Beginning at 1 second: add 1089 of each: photons + electrons + positrons + neutrinos + antineutrinos + 1079 of each: protons + neutrinos and heat to 1010K, after which the total mass/energy of the mix = ~1065grams (1032 solar masses). Let the mixture expand for ~13.8 billion years allowing much of the mass/energy to be stored within the gravitational field between the components. 2. Beginning at Planck time: inflate 10-26cm of false-vacuum (at high energy density of 1080 gm/cc, with the equivalent energy content of 10-32 solar masses or ~25 grams) and allow expansion for ~13.8 billion years. Pg. 273: Regarding a supposed beginning – applying the principle of uncertainty: an energy packet of zero energy can be borrowed for eternity. Once it is borrowed, it exists! Pg. 277: Chaotic Inflation proposed by Andrei Linde showed that the very shallow plateau is unnecessary. 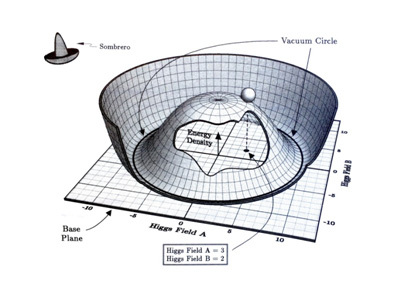 Inflation works even if the energy density diagram has the shape of a simple bowl with a unique minimum at the center provided that the pre-inflationary universe is chaotic. Most patches of space would not presumably experience much inflation, since the fields would tend to be near the bottom of the hill. The rare start at the top of the hill would undergo enormous amounts of inflation; while those near the bottom would not inflate. Pg. 278: Extended inflation proposed by Paul Steinhardt and Daile La – would result in many bubbles forming with changing gravitational field strength causing a dramatic slowing of expansion – allowing the bubbles to catch up and fill space. As of the publishing of the book – over 50 varieties of inflation had been published.